Don Rone lives in Portageville with his wife, Myra, served as mayor of Portageville for 10 years and as the New Madrid County public administrator. He was also in the Missouri National Guard and has farmed in New Madrid and Pemiscot counties over 40 years. He is a retired national accounts manager for FMC Corporation. House Reaches Session Mid-Point with Numerous Legislative Successes As the legislative session reached its mid-point, House members were able to celebrate a long list of accomplishments that include most of the Speaker’s legislative priorities. In total, the House has sent nearly 70 bills to the Senate and the two chambers have worked together to see one bill already passed and signed into law by the governor. House Approves Good Government Bill (HB 445) The Missouri House of Representatives gave approval this week to legislation that is meant to make elected officials at the local government level more transparent and accountable. The bill would require local government officials to abide by many of the same ethical standards that apply to lawmakers and statewide officials. The House has approved legislation that contains several important tools to help better prepare Missouri’s workforce for high-paying jobs. The bill is a combination of two pieces of legislation that have already received House approval, and a third that has received committee approval. The House and Senate have agreed to legislation that is meant to stop the illegal use of herbicides that have caused widespread damage to crops in Southeast Missouri. The legislature's Task Force on Dyslexia recently held its first hearing in the State Capitol. The group, which is made up of lawmakers, medical and education officials, and private individuals with expertise or experience with dyslexia, was created with the passage of HB 2379 during the 2016 regular session. Keep track of what is going on in Jefferson City! The governor's revenue growth estimate and spending plan have led the House Budget Committee to revive the Surplus Revenue Fund to ensure a fiscally responsible state operating budget for Fiscal Year 2017. 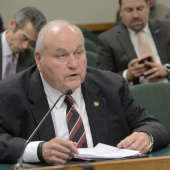 House Budget Chairman Tom Flanigan said the fund is necessary because the House is basing its budget bills on a more conservative 3.1 percent revenue growth estimate, which is a full percent lower than the optimistic 4.1 percent growth estimate put forth by the governor. This Christmas, take the time to truly appreciate the reason for the Season. Celebrate the joy of faith, family, and friends. Trust that the birth of our Savior, Jesus Christ, was the redemption of our world and that this is a time to celebrate him. From my family to yours, may you have truly blessed Christmas! On Tuesday, my office sent a letter to Governor Nixon regarding the refugee crisis and its impact on Missourians. Read the letter here and let us know your thoughts on the matter by calling my office at (573) 751-4085. It's that time of year again! Pumpkins, ghosts, and candy corn! Make sure that you're paying close attention to roadways and crosswalks this weekend. Take a look at MODOT's release about Halloween safety for you and your family! Take a moment out of your busy schedule to read my Weekly Capitol Report. My office puts this newsletter together especially for my constituents so you can read what is happening in our state's capitol. If you have questions, comments, or even information you want included in the report, please contact my office!